A species of bird which has not been seen in Greater London for 141 years has reappeared. 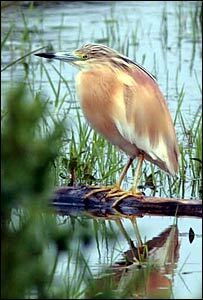 A squacco heron was last spotted at the Kingsbury Reservoir, in north-west London, in 1866. But now hundreds of birdwatchers have flocked to the Crossness Nature Reserve in Bexley, south-east London, after one was seen there last week. The sighting follows a £500,000 project at Crossness by Thames Water, Bexley Council and the charity Groundwork. Work has involved restoring reed bed and ditch habitat for water voles and creating a new wader scrape - a shallow body of water with muddy margins - which has attracted the heron. The site has also been opened up to the public with a wildlife viewing screen enabling ornithologists to get close to the bird without disturbing it. The squacco heron, which is mainly found in southern Europe and winters in Africa, has a stocky body and beige plumage. There have also been confirmed sightings of a rare purple heron flying over Crossness, and the first quail to visit the Bexley Borough since 1969 has been seen on a number of occasions this week. The squacco heron has been spotted in the Southern Marshes of Crossness. Martin Wagner, from Thames Water said: "The sighting of the squacco heron is a great success for the company as well as for wildlife. "It is exciting to see this new wetland area so favoured by a rare bird." The squacco was spotted on the afternoon of 29 May and has been seen on the marshes ever since.